This fully comprehensive guide includes all the techniques and tips you need to plan, research, write, edit, choose publishing options and market your book. Dr Trish Nicholson’s published works cover management, applied anthropology, and responsible travel. Recent books include travelogue, popular science, and writing craft for fiction and non-fiction. 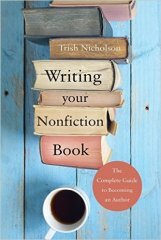 I've started writing my first non-fiction and have found this book to be so helpful in my planning as well as keeping momentum. Easy to follow and written in style/language I am comfortable with.